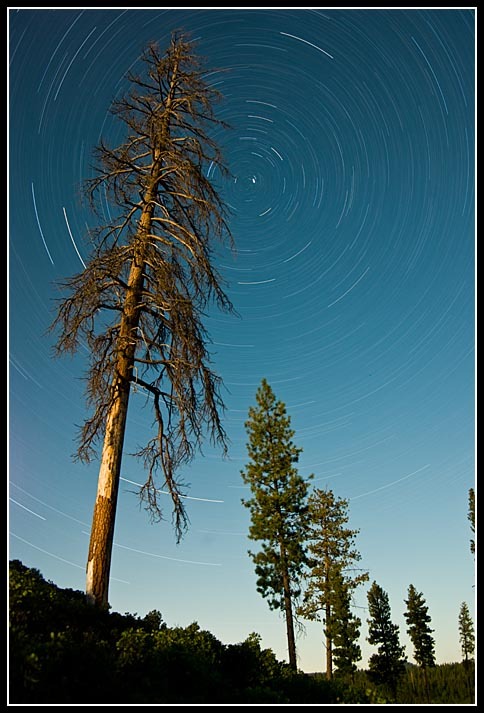 Click here in case you missed my first DSLR star trails test. Last night found me camping in central Oregon about 60 miles south of Bend. Plenty of lava fields and some trees trying to scrape out an existence. Since I usually wait too long to set up and compose my star trails shots I got a jump on things and scrambled up a scree slope to set up my second star trails test shot for my K10D. The sun had set about 20 minutes earlier, still giving me some nice silhouettes to focus and compose with. It was a clear night and I knew the stars would be out but unfortunately a 3/4 moon was out too; and it was shining right on the trees in my shot. I normally would have abandoned the shot figuring that the moon would cast too much light on the foreground and maybe even wash out the sky too much. Since I was still testing how long my battery would last through a "bulb" exposure I figured even if the shot didn't turn out it would be a worthwhile test. After setting up the shot I had at least a couple hours until it was dark enough to start the exposure. I hiked/slid back down the slippery slope to my campsite and proceeded to have a nice fire with some hot chocolate/Baileys. Ahhh, the perfect combination! By the time I was done with that it was still too light on the horizon so I did some reading before hiking back up the hill at 11:45 to find my camera and tripod in the dark...no easy task considering how brushy it was on the other side of the hill. Sure enough the moon was out big and bright and shining right where I didn't want it too. The sky wasn't as dark as I wanted and the moon was even casting noticeable shadows. At least it made walking around in the dark easier! I locked the shutter open, started my stop watch, and headed back down to the car again. My previous test had been for 1 hour and the camera/battery had no problem so I figured I'd go for 1 1/2 hours this time. I did some reading and writing to kill the time and just when I didn't think I could stay awake anymore it was finally time to lug myself up the hill one more time and search out my camera again. Much to my happy surprise I'd found the mood had dropped below a hill and had quit shining on my trees. I didn't know how long it had been behind the hill but at least it was now. I let the shutter close and drug everything back down the hill and to the car while the camera went through it's whole dark frame subtraction rigamorow. When I did a 1 hour exposure the dark frame only lasted about 50 minutes. Even though I was tired I was curious if it would go longer then that with a 1 1/2 hour exposure. I managed to stay awake another hour reading and the dark frame was still in progress. It was after 2am and that was as much time as I was willing to give that night. I went to sleep and when I powered up the camera in the morning this was the image that was waiting for me. It turned out way better then I thought it would and the moon actually did a perfect job of lightning the foreground without blowing any highlights. It wasn't the look I was going for when I set up the shot but I'll take it anyway! I've taken about 60 shots today on the same battery charge and it's still going strong. So far I'm very impressed with the K10D's ability in taking long exposures; both from a noise and battery life standpoint. I thought the images would be a lot noisier then they're turning out. I've got a little AC power inverter for my car now so maybe I'll have to get the AC power adapter for the K10D and use it with one of those little portable battery booster packs to see how it handles some really long exposures. Next time I'll try a 2 hour shot. Hello Alan, this shot is an awesome one! Keep up the good work!